A Total Distance Overhaul. Rogue X Irons are a total distance overhaul, with our 360 Face Cup and VFT, multi-material construction, Urethane Microspheres, and a component package designed for maximum distance. Tungsten Weighting allows us to position the CG in each of the long irons with extraordinary precision, promoting optimum launch and control at each individual loft. The tungsten, twice as heavy as steel, concentrates significant weight into a small space in the form of an intricately shaped part, which is key to precisely controlling CG location. 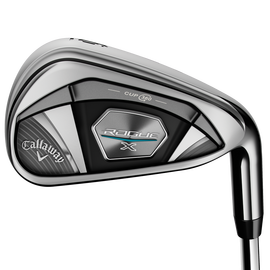 Lighter, longer, stronger: Compared to Rogue Standard, Rogue X is lighter in weight and longer in length, with stronger lofts. Wide sole pulls the CG low and deep for easy, high launch and long carry.